Construction started today on a Singapore design school that will produce all of its own energy and more. 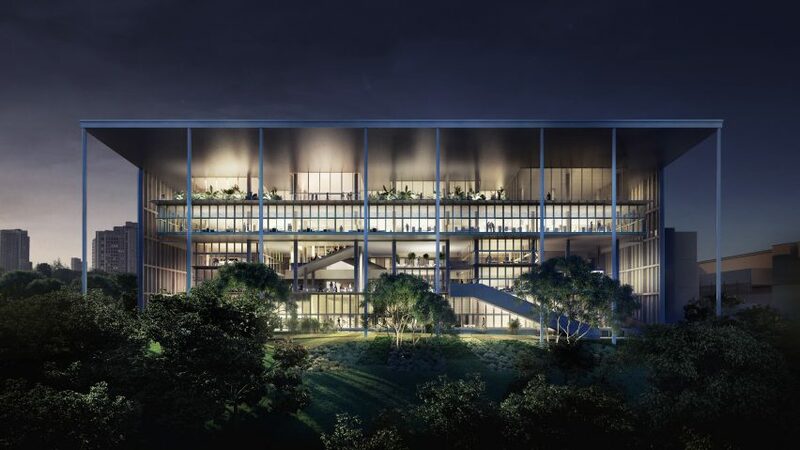 Designed as a collaboration between international office Serie Architects and Singapore studio Multiply Architects, the new School of Design and Environment at the National University of Singapore is intended to be a net-zero energy building. The structure will generate its electrical energy through 1,200 photo-voltaic solar panels on the roof. It will also incorporate a number of energy-saving features, including a cooling system that uses natural ventilation wherever possible. The aim is to demonstrate to students how important it is to consider sustainability in design – as promoted by school dean Lam Khee Poh. "As a design school with an emphasis on energy-efficient technologies, this building had to embody the principles it espoused and be an exemplar to the students, faculty and extended design community," said the architects. Widely regarded as Singapore's most important design school, the School of Design and Environment includes architecture, construction, industrial design and real estate faculties. The new building will house these departments over five storeys, with five different types of learning space. A 70-metre-long studio will offer opportunities for group learning, while a "drop-down" space will be used for crits. There will also be small research studios, workspaces known as "test-bedding areas", and spaces for socialising. Occupants will be able to open these different rooms up to the elements, to adapt levels of daylight and ventilation to suit varying conditions and activities. Meanwhile, the large over-sailing roof will offer shade from direct sunlight. "Beyond the challenges of creating a net zero energy building our emphasis was on the imperatives of learning and research as a creative and collaborative process," said Serie Architects principal Christopher Lee. Founded in 2008, Serie has offices in London, Mumbai, Singapore and Beijing. Past projects include a music studio and a banqueting hall, both in Mumbai. The firm is also collaborating with Multiply on an extension to a law court in Singapore.